The device was the prize for the Firefly Social Good raffle with all money raised going toward the three social good projects Firefly support. 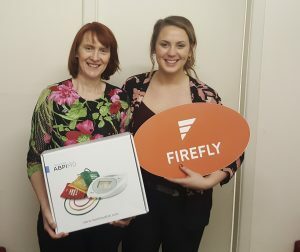 The Social Good sessions provided an opportunity for Firefly to promote some of the projects the company contribute to outside of the manufacture and distribution of orthoses. Easkey Britton, Sarah O’Connell and Saskia Rysenbry spoke to the Summit delegates about their adventures in far flung lands where they facilitated and delivered projects to improve the lives of those less well off. We’re sure the MESI device will add value to Angela’s practice in Galway city. If you didn’t attend the Firefly Summit you can read more about the event in the Firefly Summit report here.